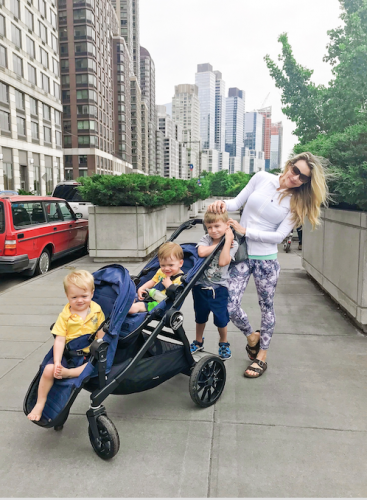 As a mom of 3 boys, twins and a toddler, living in a city where we commute everywhere, I am always on a look out for an amazing stroller to cart all of them with. Recently, we received the Baby Jogger City Select® LUX and it’s really awesome. The baby jogger is a long stroller that stacks one seat on top the other. It also has a glide board for Timothy on the back. Prior we had a side by side stroller and it was great; but this felt like an upgrade. Robert loves to be the captain of the ship in front and now is less likely to grab his brother’s snacks out of his hands. William is super content in the back seat and Timothy LOVES riding on a kick board. He is beyond excited now to go places and not have to use his little legs to walk everywhere. One of the best features of the City Select® LUX is the super large storage space at bottom. We can store all of our toys, diapers, snacks, etc. when we go out. It’s the best when I have to go grocery shopping and want to cart all of the bags home underneath. In the summer we have so many sand toys, change of clothes, etc. I love having the extra storage. The brake is located on the front right side and what I really like about it, is that once it is locked my four year old cannot unlock it. Therefore with a infant in the stroller I won’t need to worry about him trying to push the stroller when not looking (if locked). The other strollers he can figure out to unlock the bottom lock. The stroller came completely unscratched, no holes, no peeling labels and it is truly the Cadillac of strollers. It is quite easy to figure out how to quickly disassemble and reassemble; and can be folded with the seats on or off. If space is needed, the wheels can be removed to make it even smaller for our Manhattan apartment or the trunk of a rental car or cab. I like that the seats have a zipper in the back to store little things. The stroller rides and pushes very smoothly. Although, it’s a little heavy, its built to last. My husband loves it because the handle can be adjusted quite high and he’s tall. I like that the tires are sturdy for all the NYC streets and that my little twins can face each other if they want to. The only problem I have is getting it up and down our front steps to our apartment because it is a little heavier and I worry about bouncing it down with the front seat out so far in front. I also wish I could recline the seats for when they want to nap. For sure I would recommend this stroller for anyone with twins or siblings or twins and a toddler like myself. Banish Back Fat with Yoga! Just a quick tip – if you turn both seats facing backwards they easily recline for napping. We do it a lot with my two kiddos for strolling naps.